This jet Helmet is the upgraded version of the Zyclo since it has been improved with a smaller size and weight, which makes it perfect for demanding scooter drivers. Excellent quality at an incredible price. MT HELMETS has been approved by the most demanding international homologations. DOT CERTIFIED(USA), ECE/ONU 22.05.P (EU) and SNELL USA (USA) cover the most challenging US and European homologation standards.We have also been granted with the NTC 4533 (Colombia) and NBR7471 (Brazil). These homologations are only granted when every single component of the helmets has duly passed an established and exhausted security examination. 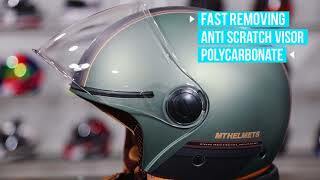 Anti-scratch visor with fast removing system. All the technology currently available on the market. Our firm MANUFACTURAS TOMAS, S.A. is a Spanish helmet manufacturer, whose trademark “MT HELMETS” is well known and have worldwide reputation in the helmet sector. We have been aware that thought the website www.mthelmetsusa.com a crime is being committed. The purchasers that ordered the helmets through this website did not received the goods, and of course there is not any commercial relation between our distributors and such individual. It is a clear case of identity theft and internet scam of which we are victims, but not only our company but the good faith purchasers.